Follow these cruise packing tips to avoid ruining your cruise vacation. Know what essentials you must pack. And what documentation you will need. A pre-departure cruise check list is essential if you want to enjoy your floating holiday. Below are essential items that are a must on a cruise ship. 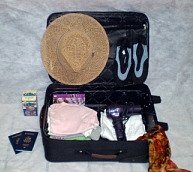 Keep important items such as medications, first aid kit, camera and batteries, along with toiletries in your carry-on. Divide your clothing between separate suitcases. That way if a luggage is lost or delayed, you have something to wear. Take only one credit card with you. Leave the rest at home. These cruise vacation tips are meant for planning ahead in case your wallet is stolen. Remember to pack your sea sickness pills and sunblock. Keep a detailed cruise packing list handy when preparing your luggage. Make three copies of your passport, driver’s license, and airline tickets. Keep a set at home with a family member or friend in case of loss. Keep one set in your carry-on bag and the third in your checked baggage. You can also scan your important documents and email them to yourself so that you can access them from any computer. Follow these cruise packing tips in case of loss or theft. Bring your own alarm clock. Most cabins do not have them. Pack a short extension cord. Most cruise ships only have one or two electrical outlets. Notify the cruise ship of any dietary restrictions you may have ahead of time. Keep items that can spill in plastic bags to avoid spillage. And keep most other items in clear plastic bags for faster security checks at the airport. This makes repacking faster if your luggage is emptied and searched. Include a flash light and night light for darkened rooms. This is especially helpful if your stateroom is an inside cabin. Choose brightly colored suitcases as these are easier to find among the thousands of other suitcases at the airport and pier. Or tie a brightly-colored scarf to your luggage handle. Wrap your wallet in a rubber band. It makes it extremely difficult to be pick-pocketed. This is one of the simplest cruise packing tips to safeguard your wallet. Keep a supply of one dollar bills handy for tipping at the airport and pier. This cruise packing tip will make your life a lot easier. Use these simple strategies for cheap travel abroad like staying at hostels instead of hotels. And opt for public transportation instead of taking a taxi whenever possible. For the price of a regular condo, you can retire on a cruise ship instead of an independent living facility. Some ships offer the option to rent your cruise ship unit. It is an affordable way to live on the water and travel at the same time. The ultimate in luxury living and travel, Cruise Ship Condos gives you the opportunity to enjoy more countries than on a regular cruise ship. This residence at sea is more like private yachting and is geared specifically with your comfort in mind. Avoid a vacation disaster by planning ahead with these simple but life-saving cruise packing tips. Make sure to keep an extra copy of your passport at home with a family member. And don't forget that night light for dark inside cabins. Then sit back and enjoy a glorious stress-free experience.